Upon creating a new item you are given the option to manage its stock. This way, every time a document is issued containing this item, Elorus will record the sale or purchase in terms of quantity and update its stock accordingly. To enable this setting from the preview page of the product select “Edit” and activate “Manage stock” option from the relevant field. Thus, every time a sales or a supplier credit note is issued the items' stock decreases, whereas when a purchase or a sales credit note is issued the items' stock increases. Moreover, the remaining stock will also be updated and will be available on the item’s preview page under “Stock”. 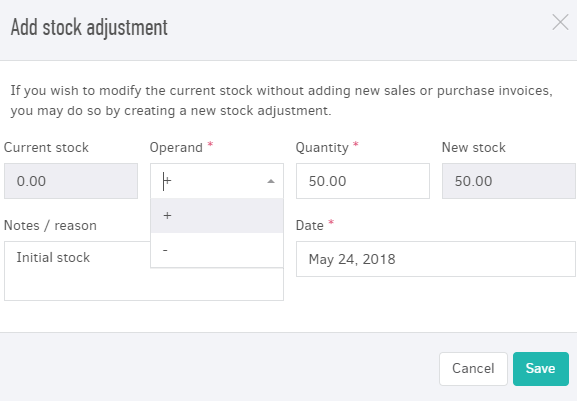 If a particular product has an initial stock quantity, you can add it through the “Add stock adjustment” field inside the product’s edit page by choosing a positive operand, as shown in the picture below. In case you need to reduce an item's stock without having to associate it to a sales document, you may do so by choosing a negative operand in the form above. Stock adjustment may also be used in cases your stock needs readjustment. This may occur if for example, you issue a credit note used for discount purposes where the quantity of items involved should not participate in the transaction. Furthermore, this function can be particularly useful in inventory check cases, where you need to alter stock quantities without involving any accounting records. Once activated, this setting will automatically create a “Product stock history” report describing the transactions an item participated in. You can sort this report by period, filter it by document types and hide/show columns depending on the data you need to obtain. Inside the "Application Settings" page you will find the "Allow negative stock" option. If deactivated, Elorus will prevent you from invoicing products whose inventory has been depleted. This setting is enabled for products with active "Manage inventory" settings. Stock management is not a default setting for your products, therefore you need to enable this function every time you create a new item and wish to monitor its stock.